Edraw Max is a flexible and versatile online diagram app with good inforgraphic support. However, it's not suitable for corporate use and there are plenty of better options out there. Edraw Max is an all-in-one Cloud based drawing tool that allows you to create diagrams, illustrations, timelines and more. Edraw Max is suitable for everything from data visualization solutions to infographics and can be used by users of all abilities. Edraw can also be used as an alternative to Visio on Mac although it’s not as powerful as Microsoft’s tool. In this review, we take a closer look at Edraw Max and what it can do on macOS. The main aim of Edraw Max is to take data and make it easier to digest in diagram form. The first thing you notice about Edraw Max is that the interface looks very similar to Microsoft Office. In fact, in general Edraw Max is a lot like MyDraw which also has a very MS Office inspired interface. There are around 260 templates to choose from including standard layouts like flowcharts, organizational charts and floor plans. In addition, there are more than 12,000 objects and symbols to illustrated and construct your diagrams with which is plenty to meet most needs. It’s also got Gantt Chart templates so that you can use it for project management although there are much better project management solutions on Mac for this. It’s also up to the job of more complex diagrams such as software UML layouts. One thing we particularly like in Edraw Max is the infographic templates. Infographics are not usually well done in technical diagramming applications but Edraw Max makes it easy to create attractive infographics to complement your Mac’s desktop publishing software or email marketing tools. You can export diagrams into Word, Excel, PowerPoint, PDF, SVG and transparent PNG Format. There’s also an Edraw Max Office Viewer Component which allows you to embed Edraw Max diagrams in a Microsoft Office document. Edraw Max can be a considered a budget online version of Visio although the reality is, it’s got nothing like the power and features of Microsoft’s product. Edraw Max can import Visio files but only in XML format. It can’t import or export Visio files in its native VSD and VSDX format. 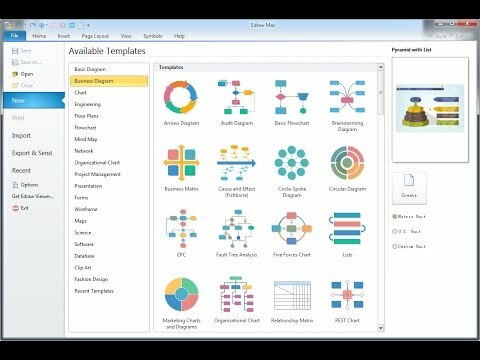 It’s certainly not a replacement for Visio and there are other excellent alternatives to Visio on Mac which do a better job. In particular, SmartDraw not only imports Visio files, it’s the only software than can export to Visio 2016 VSDX format. If you’re looking to replace Visio, we’d recommend going with that over Edraw Max. There’s nothing that really makes Edraw Max from any other online diagramming application. The infographic templates are well done and there’s some good templates to choose from but beyond that, there’s nothing special to make it stand out. Edraw Max doesn’t have any third-party integration with Confluence or Google Drive and Office integration is limited to embedding (but costs extra). Visio support is also extremely limited in Edraw Max compared to similar tools. It’s also worth noting that some of the English translations on the Edraw Max site aren’t great. It appears that the product is based in China but the translation of information to English on the website is poor. Edraw Max has a range of pricing plans depending on what you want. If you want a standard perpetual license with no need to pay for upgrades for 3 years, it costs $179. If you want a lifetime license with no upgrade payments ever required again, it’s $245. Alternatively you can pay a monthly subscription of $8.25 per month. The developer also offers other diagramming applications focused on specific areas such as Mindmapping, Org Charting and Infographics for which there are special bundle offers. You can also try a free trial of Edraw Max first.